This resource features the general description of a manor house. The Ohara Manor belongs to a powerful family. It includes adventure ideas that are appropriate for low-level (Levels 1 to 5) adventuring parties. Challenge Rating (CR) is calculated using a party of four as the model. 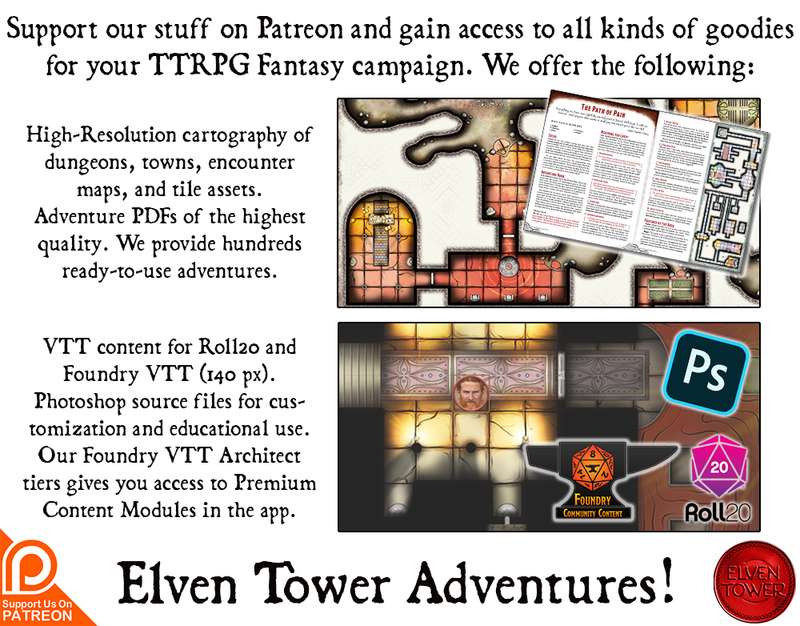 The purpose of this resource is to provide the DM extra lore to use when describing or populating a town or city. As written, the information in this article can be used in many different settings. The lore and adventure ideas here described are particularly useful when the adventuring party must deal with a politician or noble. 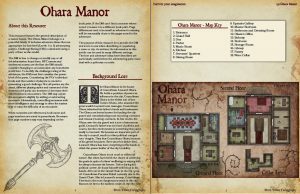 The Ohara Manor is the house of Councilman Leonard Ohara. He holds a position of power an influence in the city. Councilman Ohara is the eldest son of late Tamiro Ohara, who amassed the great wealth Leonard now manages. Councilman Ohara inherited his father’s lands and businesses. The Ohara are better known for funding the city guard and commissioning most escorting contracts and treasure hunting contracts. In few words, the Ohara own the city guard and a sort of mercenary guild. Leonard’s father was not fond of politics and courts, but this environment is something that came easily to Leonard. He became an important part of the city’s council, much to other political competitors’ chagrin. They fear Councilman Ohara because of his greed for power. Ever since his father died, Leonard Ohara has done everything in his hands to climb the power ladder of the city’s nobility. Councilman Ohara is not cruel or violent by nature. But when faced with the choice of achieving his goals in spite of others’ wellbeing or staying still, he always chooses the former. Twice during his political career, he found himself with blood in his hands. All to sit in the Grand Chair in the city council. Councilman Fareena Dubal currently sits in the Grand Chair. She is Leonard’s enemy. Councilman Fareena is the most dangerous woman in the city. Rumors tie her to the darkest circles in the city. She is always surrounded by paid muscle ready to kill any who stand in her way or pose a threat to her. Councilman Leonard Ohara has been plotting for months a way to get rid of Fareena Dubal. He only has bad ideas and dumb plans so far. Her security corps is truly astounding. When Leonard is not plotting schemes against his rivals, he takes pride in managing the different mercenary contracts in his own private guild. Sellswords and mercenaries come from around the province to close a deal in an Ohara Contract. The real person behind the operation is Galius Ohara, Leonard’s cousin. Galius has connections with the dark guilds of the city and the noble houses. He takes on others’ contracts and then gives them to the mercenaries that come looking for quick gold. They deal with all kind of missions. The usual assignments are bodyguard and escorting-on-the-road work, but they often have assassinations, smuggling, bouncing of merchandise and other things. Leonard and Galius recently had a sticky situation arise. They accepted an assassination contract to kill a certain individual who owed the thieves’ guild a sizable amount of gold. They were tipped off about the debtor’s location, a tavern. The Ohara sent three of their most efficient thugs to get rid of the debtor. The three thugs stormed the place only to discover that the debtor had muscle there too. Swords clashed, skulls cracked, and the three thugs came out victorious. However, they did not only kill the debtor and his men but everybody else in the place too. The Ohara shrugged indifferently when they heard about this. It was the day after that the truth came out. The two sons of Duke Lerstington were in the tavern. Both were dead. It’s been a few weeks since this occurred. Leonard and GaliusLerstington, however, is not resting at all. He and his men will not rest until they find out the circumstances under which his sons died. Shall they discover that Councilman Ohara is the one who sent the three thugs, the Duke will look for vengeance personally. Even if his sons were not the intended targets. Councilman Ohara and Galius Ohara manage a sort of improvised adventurer’s guild. They do it for the gold and for the fun. They receive assignments from other parties and then have the mercenaries do it for a reward. It is simple to implement this lore in any game by having any Ohara offer the adventurers a mission. Councilman Ohara can become an important quest giver to the party. Any type of mission or assignment is fair game for the Ohara Contracts, thus there will be appropriate assignments even for evil aligned parties. Leonard and Galius recently got in trouble by provoking the death of the Duke’s sons. They lay low and cut ties to other mercenaries for the time being. If the adventurers just recently completed a mission and look for their payment, they will not find Galius to collect their gold. 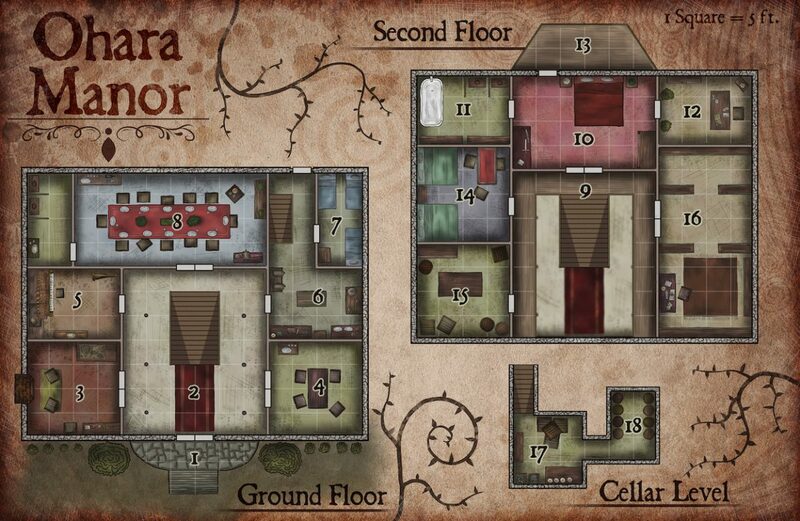 This situation alone might incite the adventurers to get inside Ohara Manor for a forced-collection. A different way to approach this is by taking the Duke’s side. If the adventurers have already accepted a couple of odd jobs from Ohara, then Duke Lerstington will summon them and explain that Ohara is a suspect in his sons’ death. The duke will offer a handsome reward if the adventurers infiltrate Ohara Manor and find evidence of an assassination contract on this sons. Councilman Ohara’s deadliest mission, only to be assigned to the toughest sellswords, is to kill Councilman Fareena Dubal. She is always surrounded by bodyguards, including spellcasters. She is also aware that Councilman Ohara is currently plotting to kill her.